The Maitland News was a local newspaper originally published by the Maitland Realty Company (and later by the Maitland News Company) which began circulation in April 1926. 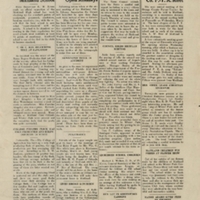 This edition features articles on topics such as the inspection of Maitland High School, a Chamber of Commerce party at Sanlando, town council meetings, library hours, a truck accident, a Parent-Teacher Association meeting, church services, poultry farms, a wedding, a bridges luncheon, an anti-tobacco and alcohol address to school children, a flower show for children, road construction, library notes, profitable farming, real estate trends, a State Beautification Convention in Ocala, the housing arrangements of local residents, and a local events calendar. Also featured is an essay on the first railroad in Orlando by E.W. Henck, and several advertisements for local businesses. Original 4-page newspaper edition: The Maitland News, Vol. 02, No. 13, March 30, 1927: Newspaper Collection, accession number 2014.002.020V, room 2, case 2, shelf 10, box GV, Maitland Historical Museum, Art & History Museums - Maitland, Maitland, Florida. Digital reproduction of original 4-page newspaper edition: The Maitland News, Vol. 02, No. 13, March 30, 1927. “The Maitland News, Vol. 02, No. 13, March 30, 1927.” RICHES of Central Florida accessed April 21, 2019, https://richesmi.cah.ucf.edu/omeka/items/show/6471.